RKIET, a promising technical Institute of Odisha, in its short history, has beaten its contemporary institutes on many accounts. 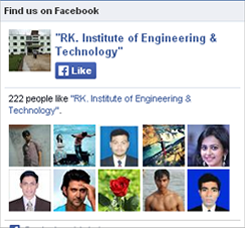 RKIET has maintained the reputation of RKIET in terms of Academics, Research, Infrastructure, social responsibility, and most important is training and placement. Being a premier institute, RKIET visualizes a wonderful future for each and every student by grooming them to realize their cherished hopes and aspirations. To materialize that it has set up a committed Industry-Interface Cell (IIC).A team of experts having tremendous industry exposures and training programs has been created to plan, execute and evaluate the training and placement aspects of the cell. The RKIET identifies the corporate needs and demands from time to time and prepares its prospective students in ENGINEERING department who are on the threshold of an exciting career. The placement cell is committed to continuous learning, and creating positive ideas, through rigorous training and preparing the young minds so that the aspiring engineers and managers can excel in their professional careers in stressful yet highly rewarding product and service sectors of industry. Student skills are honed through various technical courses as per industry standard.